Tell the story of Galaxy Zoo yourself! Could be a fun visual communication exercise to try to make another poster which conveys the same information without using any text. How would you tell the story of Galaxy Zoo? 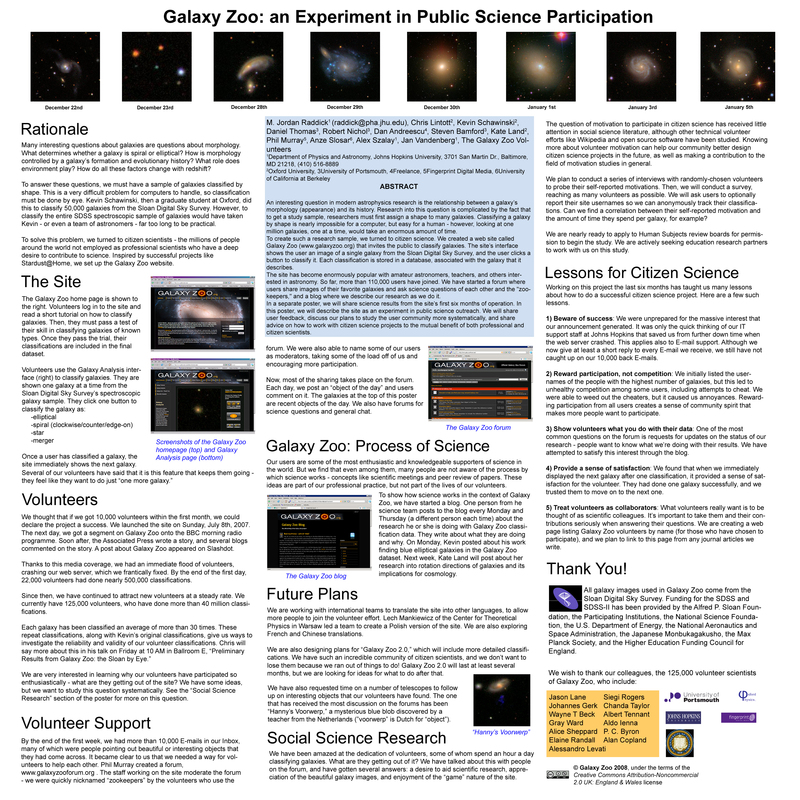 I have created a topic in the Galaxy Zoo Latest News forum called “Remix the Galaxy Zoo poster!” Post your ideas in that thread, or in comments here on the blog. Post your creations there, or if they’re too big to be uploaded, E-mail them to me at raddick “at” jhu.edu. If any of you are wise in the ways of Photoshop, E-mail me, and I can send you the original Photoshop CS2 file. We’re really looking forward to seeing what you come up with, and we hope this is fun for you too! Have fun, and keep telling the story! 1) The author names and institutions (“TeamMembers” in the Word file). This is in the standard format for scientific posters and papers. 2) The names of the volunteers, which now appear at the end of the poster. But, of course, feel free to add your own name to our randomly-chosen list! 3) The logos of the institutions involved with Galaxy Zoo. 4) The copyright statement, including the Creative Commons logo. Don’t be ridiculous, Hanny, I’ll check your English. Go for it. Same goes for anyone else who wants their English checked (although I may not be able to do it the same day).